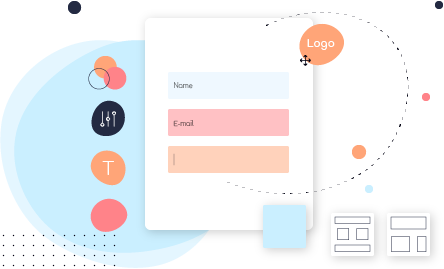 Create online forms easily, get notified about form submissions, collect and manage data in a single HTML form program. 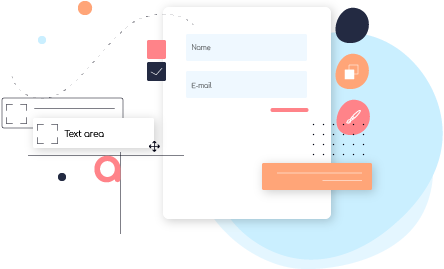 AidaForm is a complete service with an intuitive HTML form builder – and you don’t have to write any code yourself to use it. Compose your form and AidaForm will generate a working code to paste on your website. You won’t need a server or PHP scripts to collect responses: AidaForm has all of this covered. AidaForm can generate the HTML code for any type of form you create, so focus on the questions you want to ask - we’ll do everything else for you. Combine drag-and-drop blocks in a visual HTML form editor: Name, Email, Text Field and Text Area, File Upload, Drop-down List, and many more. Choose a theme to match your website design, customize colors and fonts, add your logo. Generate the HTML code in one button click - and the form is ready to publish on your website. All you need to know to use AidaForm’s online HTML form builder are the questions you want to ask your visitors. Simply drag the desired blocks onto your form template: name, email, file upload, radio buttons, drop-down menus, text areas, signature fields, and more. You can add required fields and CAPTCHA protection to make sure only adequate responses are accepted; even integrate payment processing without writing any additional code. Make your form match the design of your website to provide a smooth experience for your customers. Add the logo of your company to the form page, select a theme and customize its font and colors, or even add a background image. Save this custom theme as a template and apply it to other forms you create in one click. The AidaForm HTML form maker generates the code for your responsive online form automatically – no additional programming or integrations required. Simply copy the code to your website and start collecting visitor data right away. That’s how easy it is with a simple HTML form builder. Every response is collected and safely stored in your account at AidaForm. You don’t have to log in every time to check how the things are going – we’ll notify you about each submission per email. Analyze form responses separately on your AidaForm dashboard or make a visual summary. Export emails to create newsletter databases in MailChimp and start targeted campaigns. Save responses as Google Sheets or export them to any compatible app with Zapier. 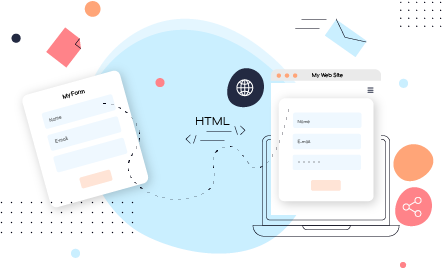 AidaForm is an all-around service where you can make any kind of HTML forms, gather form submissions and keep customer data safe and secure in your personal account. Review responses or export data to compatible apps like Google Sheets, MailChimp, or Zapier. 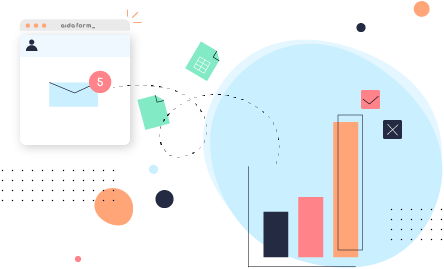 Create feedback and contact forms, customer satisfaction surveys, job application and event registration forms with responsive blocks and great usability. AidaForm takes care of all the technical stuff so you can focus on your business. Surveys let you learn more about your visitors and make it easier to appeal to your target audiences – their goals, interests, and preferences – in a fun and interactive way. Improve your service and customer experience based on the feedback you collect. People appreciate when you listen to their opinion. Make feedback forms with ratings, multiple choice questions and drop-down lists and learn how you can make your business better. Gather event and job applications through online forms with all the necessary information like names, emails, special requirements, and comments. Make sure the applicants can attach their CVs and other relevant files to their application.